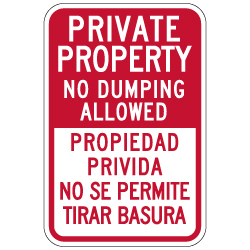 English: Private Property No Dumping Allowed. Spanish: Propiedad Privida No Se Permite Tirar Basura. Reflective Rust-Free Heavy Gauge Aluminum Property Signs with Anti-weather and Anti-graffiti protection Available.